As an exercise science major, you will study how the human body works in health and disease, how the body moves, and how it responds to exercise. Injury prevention and the proper restoration of an injured body are also thoroughly covered. In addition to fulfilling discipline specific coursework, you are also encouraged to take electives or a formal minor in fields such as health communication or business administration. Read our major requirements. Use our pre-physical therapy program plan your coursework! 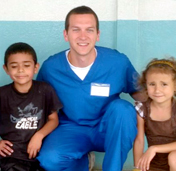 After graduating from Bethany, Dan completed a medical internship in Costa Rica. He is currently in the Doctor of Physical Therapy program at The College of St. Scholastica.